Superman is a pretty straightforward figure. I don't have any of the C3 figures so I'm not entirely sure how much of him is pulled from those tools but certainly the deco is all new. Primarily he features the muscle detailing that's really bumped up the great look of Minimates in the last several years. It adds a lot of dynamism to otherwise simple figures. The cape covers the entire top of the torso with a hole punched in it to slide over the neck peg. Sculpturally, though, most of that part is a flat piece with only the sides looking "cape-ish." That way we have the "connects at two points" look rather than the "wraps around the neck" look - a subtle but nice touch. The underside of the cape also has some blocky ribbing near the top to keep from bobbling around the torso too much. 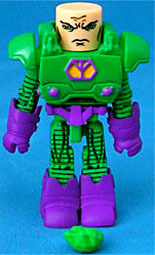 Lex is one of the more ornate figures of the first series and indeed the entire line. He comes with new boots, gloves, belt and torso piece to give him his battle suit look. It's kind of an amalgamation of his various suits combining most of the look of the Superpowers suit with the coloring of the "Public Enemies" suit. Overall it works quit well, though the purple is a little too rich for my taste. The gloves certainly look like they've been reused in Iron Man figures but I don't see them on any of my figures, so perhaps I'm just imagining things. [nope, you're not. --ed.] And speaking of Iron Man, a neat precursor to those figures is that the torso block paint continues up under the chest armor, so it's almost a second outfit. Too bad there are no alternate hands and feet (this was before AA started including spares). However, there is an accessory included - a little hunk of kryptonite. It's a decent little crystalline sculpt (I haven't tried to have any figure hold it) that's sadly painted in the same shade of green as Lex's suit. As a result it just doesn’t stand out on its own, and, of course, translucent green would have been much better. One the greatest things about Minimates is their re-configurable nature and this set is ideal for it. While a true Clark Kent can't be had without glasses (we suggest an Egon), there are some fun variations to be had - especially with Lex! This entry was posted in Art Asylum, DC, MMMR and tagged Superman. Bookmark the permalink. 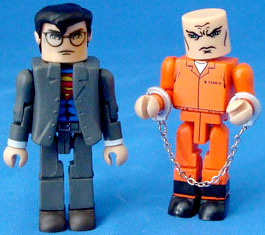 Yeah, I still love Silver Age Superman stories where Lex was constantly in his jailhouse outfit because it made sense. . . if he finally defeats Superman, he can change his clothes; if not, well, he's already dressed for his return.